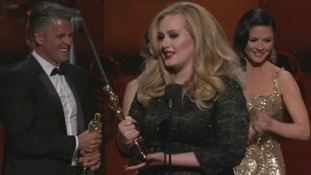 Adele has won an Oscar for her James Bond theme Skyfall, which she co-wrote with Paul Epworth. The 24-year-old smiled as she picked up the award for Best Original Song from Richard Gere but became tearful as she made her acceptance speech. She thanked Epworth for "believing in me all the time" and said of her partner Simon Konecki, "And my man, I love you baby". Earlier in the evening Adele took to the stage to perform Skyfall, the theme to the 23rd James Bond film. The Bond movies are the longest-running franchise in movie history.